Sweep the dearest people in your life off their feet on Raksha Banshan by sending this Elegant Rakhi Hamper of Delightful Delicacies wrapped up along with free Rakhi, Roli, Tilak and Chawal to deliver prosperity to their lives. This adorable Gift Hamper is teamed with 1 Kid Rakhi, 1 Bhaiya Rakhi, 1 Kg. Tin Bikano Rasmalai, 200 gm. 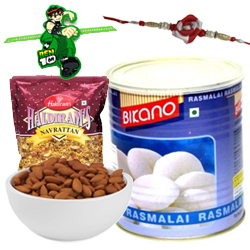 Pack of Haldirams Navrattan and 500 gm. Almonds.